2nd ed. 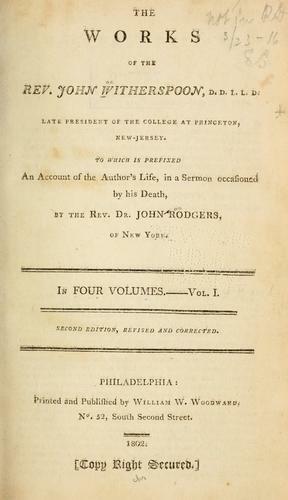 of "The works of the Rev. John Witherspoon, D.D., L.L.D., late president of the College at Princeton, New-Jersey". 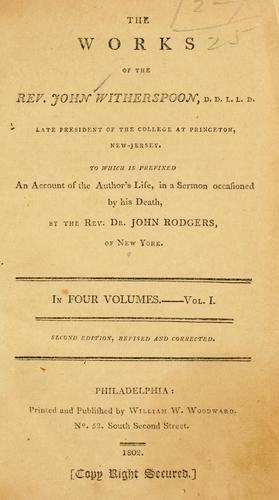 Publisher: Printed and published by William W. Woodward. The FB Reader service executes searching for the e-book "The works of the Rev. John Witherspoon, D.D., L.L.D., late president of the College at Princeton, New-Jersey" to provide you with the opportunity to download it for free. Click the appropriate button to start searching the book to get it in the format you are interested in.